Summary: A new study reveals execution of action is a combination of random and predictable components that are processed in different brain regions. Source: Champalimaud Center For The Unknown. Deciding when to take an action can be as important as deciding what action to take. Even in the best controlled of laboratory settings, the timing of a subject’s decisions is impossible to completely predict. And this apparently random component may play an important role in evading competition and exploring options. Now, neuroscientists at the Champalimaud Centre for the Unknown, in Lisbon, Portugal, have shown that the exact moment of the execution of an action is the combination of a predictable and an unpredictable component that are processed by different regions of the brain. Their results are published in the May 17 issue of the journal Neuron. Being able to choose the right time to act is crucial for a successful outcome in many situations. Act too soon or too late, and the target will be missed, an opportunity lost or time wasted. Getting the timing right requires that the one learns from experience and adapts to the current situation. One might think that injecting “noise” in the timing of actions would be counter-productive. But it often pays to be unpredictable. Take soccer: the ability of a skilled shooter to outwit the goalkeeper depends in part on his ability to deliver the ball at an unpredictable time and location. If the same action were performed in the exact same way and at precisely the same moment every time a situation presents itself, organisms would be easily outwitted by competitors. Moreover, there would be no room for exploring better solutions, for creativity. How does the brain manage to optimize the timing of actions to the circumstances whilst still retaining a good measure of unpredictability? That is what the authors of the new study set out to unravel. To study this, the scientists trained rats to perform a task that tested the animals’ patience. The rats heard a tone and had to decide, at a certain point, to move to a water dispenser to quench their thirst. However, they learned that if they were patient enough to wait for a second tone (for a random amount of time) before moving to the spot where they would be rewarded, they got substantially more water than if they sought their reward before hearing the second tone. As expected, in this setting, how long the animal is willing to wait for the second tone is partly predictable. But at the same time, there is an important random component, a substantial dose of unpredictability. In a second phase, the team repeated the experiments, only this time they also recorded the simultaneous activity of multiple neurons in the rats’ brain, either in a region of the prefrontal cortex (involved in decision-making, planification and learning) called MPFC, or in a region of the motor cortex, M2, thought to be involved in the direct control of movements. Both these regions are needed for deciding the right timing of actions. With neural recording experiments, they found that, in M2, neuronal activity reflected both random and predictable components of action timing. But the “most surprising” finding, says Masayoshi Murakami, the study’s first author, was that MPFC has nothing to do with action timing randomness. “I showed that MPFC does not care about the random part – and it is this separation [of function between M2 and MPFC] that is new”, he adds. Different brain regions introduce predictability and randomness in the timing of actions. NeuroscienceNews.com image is credited to Gil Costa (Champalimaud Centre for the Unknown). Funding: Funding provided by European Research Council, Simons Foundation, Fundação Champalimaud, Israel Science Foundation, Gatsby Charitable Foundation, Fundação para a Ciência e a Tecnologia, Uehara Memorial Foundation, others. Image Source: NeuroscienceNews.com image is credited to Gil Costa (Champalimaud Centre for the Unknown). Champalimaud Center For The Unknown “How the Brain ‘Plays’ With Predictability and Randomness to Choose the Right Time to Act.” NeuroscienceNews. NeuroscienceNews, 17 May 2017. 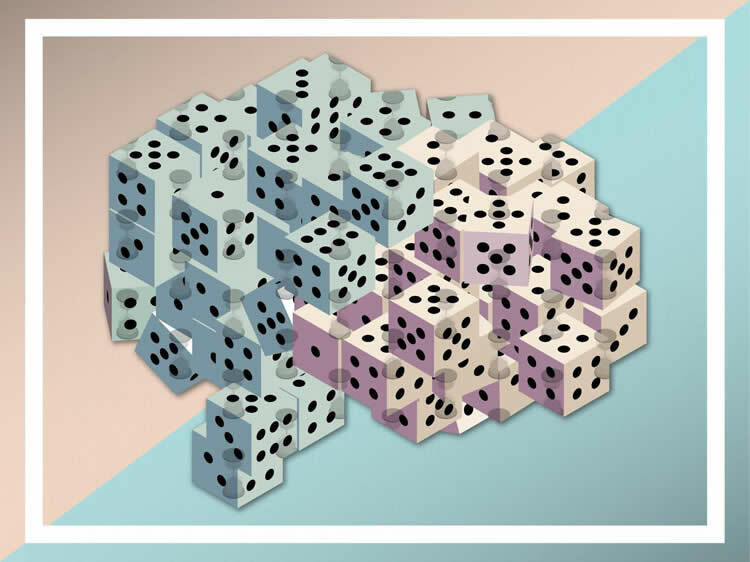 Champalimaud Center For The Unknown “How the Brain ‘Plays’ With Predictability and Randomness to Choose the Right Time to Act.” http://neurosciencenews.com/predictability-action-randomness-6703/ (accessed May 17, 2017). The selection and timing of actions are subject to determinate influences such as sensory cues and internal state as well as to effectively stochastic variability. Although stochastic choice mechanisms are assumed by many theoretical models, their origin and mechanisms remain poorly understood. Here we investigated this issue by studying how neural circuits in the frontal cortex determine action timing in rats performing a waiting task. Electrophysiological recordings from two regions necessary for this behavior, medial prefrontal cortex (mPFC) and secondary motor cortex (M2), revealed an unexpected functional dissociation. Both areas encoded deterministic biases in action timing, but only M2 neurons reflected stochastic trial-by-trial fluctuations. This differential coding was reflected in distinct timescales of neural dynamics in the two frontal cortical areas. These results suggest a two-stage model in which stochastic components of action timing decisions are injected by circuits downstream of those carrying deterministic bias signals.